Domer Network - What Is A Domer? 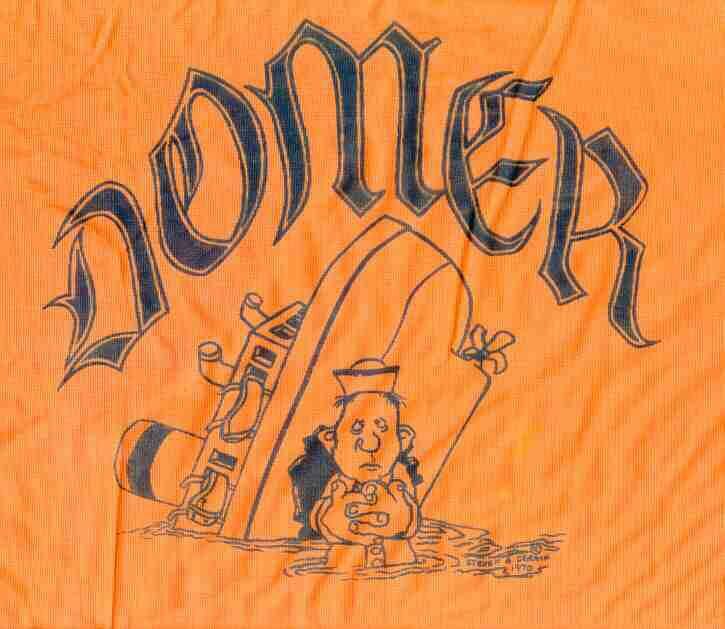 The original "Domer" T-shirt. Thanks to ALPHONSE GUARDINO '71 who scanned this and the creator, classmate Steve Cernik, circa 1970. Many of our Alumni, especially from pre-1970's classes, have seen the term "Domer" on this site and in various Alumni Association publications and have inquired about its meaning and origins. As it turns out, it is very difficult to pin these things down. (Class of 1953) "I don't recall having ever heard of the school being referred to as the Dome"
(Class of 1964) "..the term Domers came after 1964"
(Class of 1965) "..never heard of "The Dome" until your last e-mail"
(Class of 1968) "First heard of the term Dome when I returned to the Fort as an instructor in 1973-74...The derivation I heard was that the Dome represented an enclosed space of human life and endeavor separate from the outer world. I believe it derived from one of the science fiction movies of the early 70's late 60's. What took place inside the dome was completely separate from the real world outside." (Class of 1971) "I believe that the term Domer may have originated during our time. Before I every heard anyone say Domer, I heard cadets refer to Fort Schuyler as 'The Maridome'. Where the terms came from I don't know. But I don't think it was in popular usage during our Mug year." (Class of 1971) "I believe that the nickname 'The Dome' started with some guys from the class of '70 (the year ahead of me) playing a table-top hockey game in their dorm room the year I was a MUG. One 'spectator' was joking around, acting as if he were Howard Cossel doing commentary. One of the things he said was 'Here we are at the Maridome ....'. For some reason MARIDOME got picked up and repeated. By the time my class graduated it had been shortened to just 'the Dome.'" (Class of 1972) "I first heard the expression "The Dome" in the Fall of 1968 as a Mug. We even printed t-shirts with the inscription 'Domers.' As far as I can recall, the expression came from the fact that the Throgs Neck bridge expanded over the fort, creating Maridome College at Fort Schuyler." (Class of 1972) "First heard at a sailing party in 1969 and used by Al Guardino ' 71. Perhaps the origin of this term is quite simple: (a) SUNY Maritime is always looking for ways to recruit quality students; (b) Sports and appropriate facilities play an important role in this process; (c) Noted sports arenas include, for example, the AstroDOME and the SilverDOME; (d) Hence the birth of the MariDOME, often abbreviated as the Dome and inhabited by Domers." WHERE: Standing at attention in my room during inspection. (Class of 1980) "...we were told during IDO training in the Fall of '76, that the reason Fort Schuyler was called 'The Dome' was because the first thing you could see of the Fort, when returning from cruise, was the dome of the Observatory on the top of the fort. It seems too simplistic, but during IDO week you will believe anything your instructor tells you, or get great biceps from doing push-ups." (Class of 1981) "I first recall of hearing the school referred to as the Dome during my indoctrination period in August 1977. Obviously, it was the indoctrination officers that were feeding us all this information. In the spirit of the school, when it was my turn to be an IDO, I propagated the same information. I understand the school was called the Dome, because once you were allowed in you could not leave until graduation. (Sort of like roach motel, I guess.) This term is probably left over from many years ago when the discipline and regimentation was more important." (Class of 1982) "I first heard of The Dome when I was a mug at Maritime. I was told that we were seen as 'Dwellers under the Dome' by our rivals at Kings Point. In fact, I confirmed this with my childhood best friend who attended KP while I was at Maritime. The Dome that they were referring to was the observatory "dome" at the fort." (Class of 1985) "I remember hearing the term from my section leader during IDO week in 1981....I don't remember why it was brought up - there was so much new trivia to learn at the time. The term DOME, it was said, was coined by our 'rivals', Kings Point, because of the MT Department's planetarium dome installed on the corner of Ft. Schuyler (almost directly opposite KP.) Because the term was somehow appropriate, it was adopted by cadets as a way of describing Ft. Schuyler. Those who attended SUNY Maritime became DOMERS. It was never explained how the term was passed from Cadets at KP to cadets at Maritime." (Class 1985) "This summer ... aboard the restored liberty ship JOHN BROWN.... Maritime alumni gathered for a brief meeting. A number of alumni who had graduated during the 80's kept referring to themselves as DOMERs and to our alma-mater as the DOME. An older, retired alumnus soon spoke up and said, 'We're not Domers ! There was no dome when I was at Fort Schuyler.'" (Class of 1985) "It was shortly after IDO week that this term came into my life and the lives of everyone in the class of 85. Needless to say it was the upper-classmen returning from summer vacation who taught us that we were all Domers .... During my years at the college , we never really referred to it as the Dome. However, we did call ourselves Domers. This was in direct reference to the planetarium dome on the fort." (Class of 1986) "During and shortly after my IDO Week (August 1982) my IDOs gave us two explanations for Dome and Domer. The first was that the R. J. Reynolds Planetarium atop the Fort was shown as DOME on the local nautical chart, giving the school that nickname to those who saw the designation during their travels. ..The second explanation was that the blue hard-hats we wore with the dungaree work uniform (they called them 'abrasion caps') looked like domes." WHERE: Standing on the point in formation looking at Kings Point being yelled at by IDO's for something." (Class of 1988) "... it was always my understanding that it was given to us by our friends across the Sound when they looked over and saw the observatory atop the Fort. As a cadet, I looked across the Sound to Kings Point and would see a straight pin-like structure (their famed flag pole). Whatever the reason for our namesake, I am far prouder being a 'Domer' than a 'Pinhead.'" (Class of 1990) "My IDO, during IDO week (August 1986) informed the section on an early morning run around the point, that we were called Domers because of the white observatory dome on the fort. Supposedly the term originated at Kings Point, because when they looked across the river the most discernable object they saw was a large white dome. So the school was the Dome and we were called the Domers. Because of having that nickname, Schuyler supposedly came up with the nickname of pinheads for Kings Point. This was due to the fact when we looked across the river, we saw their large flagpole .... I always thought it strange that we had a nickname after an old unused facility at the school that no cadets had used or even seen in who knows how many years." Peter Amoroso, Bob Blochlinger, David Brown, Walter Burke, Cesar De Windt, Austin Dooley, Andy Fosina, Paul Gilmour, Al Guardino, Charles Hudson, John Ingram, Bob Kennerley, Tim Lewis, Barry Marsh, Rodney McFadden, Craig Olsen, Detlef Presser, Len Sutter. Mrs. Filomena Magavero, Librarian Emerita, Honorary Member, Alumni Association. According to the 1965/66 College Catalog description of the Science Department laboratories: "An Astronomical Observatory [on the roof of the fort] has been completed in July 1965." (p.30). The RJ Reynolds Planetarium, which features an A-1 Spitz projector, is located in a room with theater seating inside the fort on A-Deck above the Mail Room. The nautical chart for Long Island Sound and East River - Hempstead Harbor to Tallman Island (No. 12366, 25 ed., dated 12/28/96 ) does not indicate any dome on the fort. It does still seem to show structures that were demolished thirty years ago, namely the old Business Office/Gym/Armory and Machinery Hall buildings. The United State Coast Pilot 2 Atlantic Coast: Cape Cod to Sandy Hook (29th ed, 1996) does not mention the observatory dome in the entries for Throgs Neck (400) or Fort Schuyler (401). Survey results prepared and distributed by Richard Corson on January 14 1998.